I was on my way home from the Diabetes Ireland advocacy forum still thinking about how carried away I got with my own diabetes needs, when it occurred to me that if I was newly diagnosed all over again? If I was 20 year old me again and newly diagnosed what would I want knowing what I know now about what’s out there in diabetes management? How would I feel if I had a diabetes do over! Back in 1993, the was no media attention on any type of diabetes and so when I presented in a&e, as an adult, in the shape that I was, there was none of this “type 1 diabetes is only diagnosed in children” nonsense like there is today. 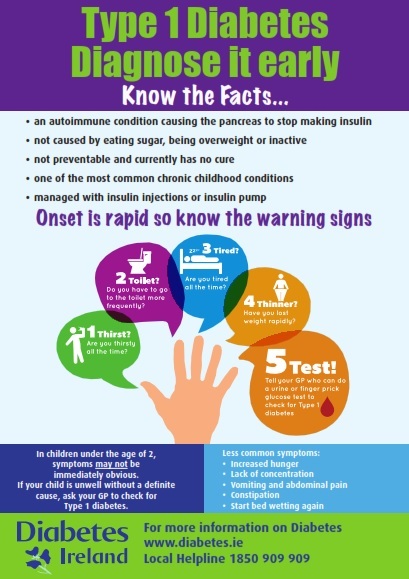 Do you know that 15% of adults with type 1 diabetes are incorrectly diagnosed as type 2 first? See the symptoms not the age! I was on my third day in hospital when my official diagnosis was delivered to me. That night was the first of many that I sobbed myself to sleep. I really would’ve appreciated someone to tell me that this was a life changing diagnosis and that it was ok to be angry, shocked, sad, uncertain, etc and not that “I could lead a perfectly normal life” when there was a “but”. If I was to start my journey as a newly diagnosed person with diabetes I most definitely would want a diabetes education Programme to be the first thing I had access to. It make such a huge difference having explained to you what diabetes actually is, how insulin works: the onset, peak and duration of it, the different types of carbs and how your body uses them, know the many other factors that have an effect on glucose levels. And later on being confident enough to adjust your doses to make living with diabetes a little more flexible and doable. The first time around i was 10 years diagnosed before this was available. If I was diagnosed where I live today, It is most likely that I would be referred to a diabetes clinic in 2019 that doesn’t have diabetes education part of Ireland’s standard of care for people with diabetes and doesn’t have a dietitian. If I was lucky enough to find out that a diabetes clinic just a little bit further away from me did have diabetes education I would have a 2 year wait for my first appointment there and then another waiting list for the education. *** Diabetes education or carb counting are not part of the standard of care for people with diabetes in Ireland in 2019. 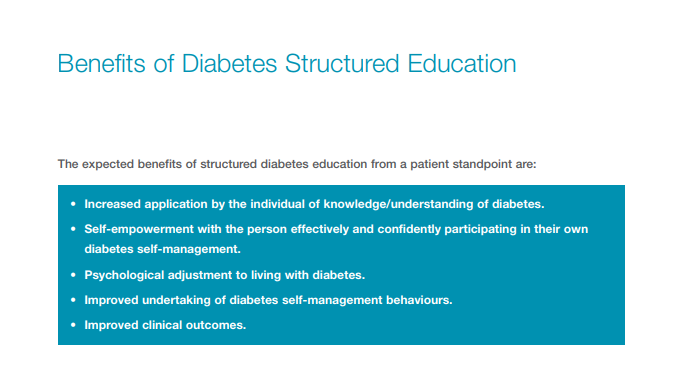 Why is Diabetes Education still not part of our standard of care? ...be able to access diabetes care expertise and self-management education that is appropriate to their needs and in a location that is convenient and acceptable to them. Increased application by the individual of knowledge/understanding of diabetes. Psychological adjustment to living with diabetes. Improved undertaking of diabetes self-management behaviours. When I was diagnosed there weren’t many treatment choices. I started out using hypodermic needles and drawing up my insulin from vials. Then, soon after I moved onto prefilled insulin pens with disposable needle tips and 9 years ago I switched to an insulin pump. Globally, these days there are multiple choices; there is the choice between insulin pens with different types of insulin’s or insulin pumps. There are self management blood glucose meters, Flash or continuous glucose monitors. But this is not the situation in Ireland. I would like to have choices in my treatments and I would my doctors and/or nurses discuss these options with me. Unfortunately, just like my access to diabetes education it is unlikely I would have access to these choices at all. There more things on my list but I feel that these are my top 4 and that without any of those factors in my diabetes care, I would have a real chance at reducing my risk of developing complications of diabetes by my forties. Why don’t we have these four factors as a basic standard of care for people with diabetes? That’s a really good question!!! I really don’t know the answer but maybe someone out there does? HSE spends €1.45 billion (10% of its total budget of €14.5 billion) on diabetes care in Ireland. Yet, not one single person responsible for how this spend is managed or accounted for! Approximately 49% of this €1.45 billion is spent on hospitalization for complications of diabetes. Ref: CODEIRE study. In 2019, is our health service being medically negligent in not addressing the unequal and low standard of care for people with diabetes? Is this a gross mismanagement of 10% of our health services funding because half of that figure is used to treat the complications of diabetes. So, if the world played some cruel trick on me and made me a newly diagnosed 20 years student again I would like to have, at the very least, those four factors as a standard part of my diabetes health care and not have to spend almost 20 years chasing them all down. I don’t need any of these things now but approximately 180,000 people in Ireland do.